The PADI Advanced Open Water Diver is designed to give you the confidence, skills and experience to take your diving to new levels of excitement and enjoyment. 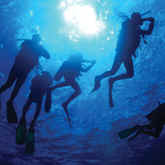 This class is perfect for the newly certified diver or the more experienced diver with numerous dives under their belt. The majority of the class consists of actual in water diving experience where you will complete five open water training dives. Each dive in the Advanced Open Water Diver Program may be counted towards the related PADI Specialty course. Dives are on Saturday at Square Lake near Stillwater, Minnesota and on Sunday at Lake Wazee near Black River Falls, Wisconsin. Prerequisite: PADI Open Water certification (or qualifying cert. from another organization) and 15 yrs old. Course Fee: $269 - The course fee includes: PADI Advanced Open Water Diver Manual and certification processing. Scuba equipment is not included, but may be rented* (advanced reservations recommended). *Gloves appropriate for local water temperatures and strap fins with boots are required for the course, but are not available for rental. Read the PADI Advanced Open Water Diver textbook and complete knowledge reviews at the end of each module. You also need to complete a PADI Student Record File (which includes a Medical Statement). If you answer yes to any of the medical history questions, we must require a signed physicians approval before you participate. You can download and review the PADI Medical Statement here. Please print a copy to take to your physician for their approval and signature if required. *For classes marked "Lake Wazee Weekend", there will be no Thurs. class session. Entire course weekend will be held at Lake Wazee near Black River Falls, WI. PADI Advanced Open Water Diver materials are included in course fee, and are yours to keep. Option: Stay warm and learn drysuit diving in your Advanced Open Water Class. Get the details.